The talk at the farmers market this past Saturday was using the garlic scapes to make a a pesto and use it for seasoning meat, similar to a meat rub or glaze. The pesto can be made in large batches and frozen in small "servings" (ice cube trays work well). 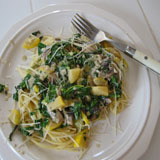 We have several recipes on our blog here. Also, garlic scapes will keep well in a loose (not sealed) plastic bag in your refrigerator crisper drawer. With the cilantro and parsley this week, I highly suggest making cilantro pesto which our family makes in bulk and freezes to eat all winter. It is great on meat or with tortilla chips. We like this recipe. Please take some time to search around the recipe section of this blog. We've collected recipes over the years and hope it helps give you some ideas for using your share of produce. We also welcome any recipes you would like to share. Photo: Greenhouse #5 and a 300 foot row of shell peas. Two of our farm helpers weeded a row of squash and zucchini today. Their report is that the plants are loaded with 100's of tiny baby fruit. Well, we all know how fast squash and zucchini can grow, so it shouldn't be too long before they are ready to harvest. Shain dug up some fresh garlic for you this week. As you can see, it's still a little small so we will let it grow a little longer. But the flavor is all there! The garlic plants aren't looking as healthy as in years past (they've been frozen, hailed on, water logged, and overcrowded with weeds). We just aren't sure how the harvest will be this year. Shain is concerned and paying close attention to it nearly every day to determine just the right timing to stop watering the plants and begin the curing process. The peas are finally taking off. I hope to have peas for you next week! Shain thinks it won't be too long before the CSA carrots are ready to dig. One good thing to come of the cool spring is a delay in some of the bug problems we experience on the farm. This past week, however, we have noticed an increase in the bugs, especially caterpillars, grass hoppers and ear wigs. When the salad mix gets infested with caterpillars, it takes longer to cut, sort and wash. 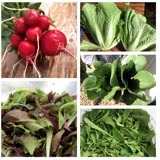 This week, it took one full day just to do the salad for the CSA and a few of our accounts. Soon, we will have too much other produce that is ready to harvest to justify spending a one full harvest day processing the salad mix. Then when the bugs aren't as bad, we will go back to harvesting salad. Shain borrowed my camera this past Sunday evening and took a few pictures of the farm. Greenhouse #4: several varieties of tomatoes, cucumbers (center row), and peppers (right of center). Field #4: rows and rows of Yukon Gold and Red Norland potatoes. Your share is still a little on the small side this week. We share your disappointment with the delay of our summer crops. You can expect to see a gradual increase in produce over the next few weeks. Several more crops are on the verge of being ready to harvest: Italian parsley, Swiss chard, garlic, and snap peas. Many more are planted and are also growing well. We still have a few areas of the farm that are in desperate need of weeding so the plants will grow, but we are diligently working on this as well. For those of you who are not familiar with garlic scapes, they have a mild garlic flavor and are a fun gourmet treat that is only available a few weeks of the year. I've written about them several times before on this blog, but basically they are the center of the hard neck garlic plant. The scape (or stalk) stays tender and curly for just a short time (1 week usually) and then gradually "hardens off" (becomes more fibrous while straightening out) and developing a seed pod on the end. Because we want all the plant's energy going towards developing the garlic bulb underground and not diverted towards "going to seed", the scapes are snapped off. Enjoy the garlic scapes this one more week. If we are lucky, there may be another batch next week. There are several garlic scape recipes on this website. As a quick summary, garlic scapes can be chopped up into smaller pieces (similar to how you'd use scallions or green onions) and added to so many recipes: eggrolls, omlets, hamburgers, stir fry, etc. They can also be cut into larger 1 to 2 inch pieces and either sauteed or roasted until tender and enjoyed with a little salt and pepper as a side dish. I've read about people roasting them whole on the grill, basting frequently with olive oil and seasonings. Garlic scapes can also be made into a pesto or paste, which can be used on pasta, meat, crackers, or bread. A small spoonful of garlic scape pesto could be added to nearly any recipe to add the nice garlic "umph". Last, I've seen recipes for pickled garlic scapes which I really want to try someday. Tara transplanting about 1,500 basil plants, June 30, 2010. My absence from this blog usually indicates our lives are extra busy at home and on the farm. I'm sorry for the lack of farm updates and short newsletters. Thoughts cross my mind frequently throughout the day of details I want to share with you. I see things and think "I wish I had my camera" so I can show you what I'm seeing and experiencing. I'll try to do better. Meanwhile, I'll let you know we are still working heavy on the weeding, and last Saturday was our first farmers market. This is our "busy season". We will have around 25 Berkshire hogs ready along in Jan, and Feb. They are fed an all natural diet consisting of locally raised Barley and hay, and not so local soybean meal, no drugs, or animal by-products. We Harvest at about 350 pounds live weight, giving about a 270 pound carcass. Quarter, half, or whole hogs are available. We have three processors to choose from that we are Happy with: Afton, Georgetown, and Lewiston. We will deliver to the processor. $100 deposit is needed to order. Order early as the processors need 3 to 4 months to schedule. PS The chickens are approaching size, so folks can get their orders in anytime now.